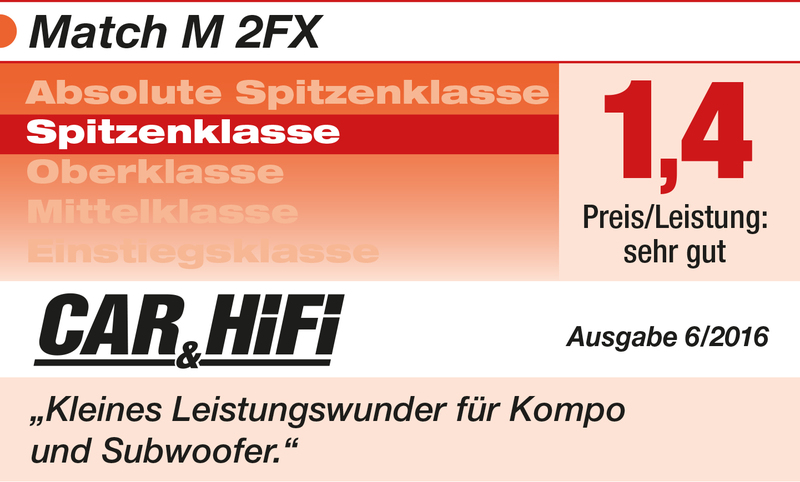 Tiny amplifier with big ambitions – the M 2FX combines smallest dimensions with huge power and highest versatility. Audiotec Fischers unique Class GD concept combines the benefits of Class G technology with the main principle of a Class D amplifier. The result is an exceptional high efficiency that outperforms conventional Class D amplifiers. By varying the internal supply voltage depending on the amplifier’s input signals, idle losses are significantly reduced and overall efficiency is close to maximum at any time. So heat dissipation is almost negligible thus allowing smallest heat sinks and most compact form factors for space saving and hidden installation concepts, that were not previously possible. The latest generation of OE car radios incorporates sophisticated possibilities of diagnosing the connected speakers. If a common amplifier will be hooked up failure messages and loss of specific features (e.g. fader function) quite often appears - but not with the M 2FX. The new ADEP circuit (Advanced Diagnostics Error Protection) avoids all these problems without loading the speaker outputs of the OE radio during high volumes unnecessarily. The switched power supply of the MATCH M 2FX assures operation even if the battery’s voltage drops down to 6 Volts during engine crank.